I love to decorate for Christmas. Its just about the only holiday that I go decor crazy over and try to transform everything in my house. This year is looking pretty good, I even managed to wrap some of the pictures on my wall to look like hanging presents. My husband looked at me while I was crazy and my son asked me who's present that was hanging on the wall. I eventually forced them both to admit they thought it looked pretty darn good. Whether they really thought that with their boy minds or not. Im off on a tangent here. What I am trying to tell you is I picked up some new very easy, very cute ideas from pinterest this year that you can totally pull off too! 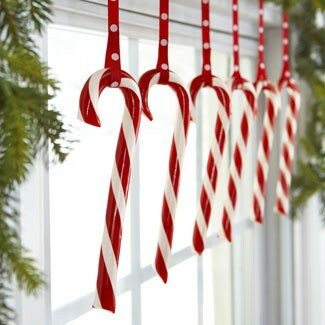 Fancy up your windows with some candy cane! 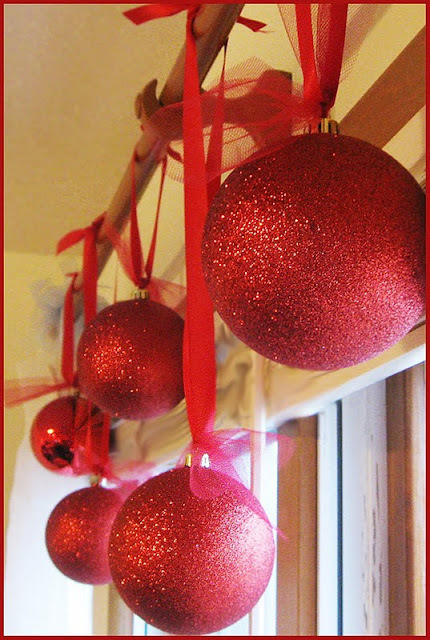 Doesnt take much, just loop some Christmas colored ribbon around those yummy treats and tie em up onto your curtain rod in a bow. Or you can always throw some garland up there too! Same idea found here on Fresh Poppy Design, but with beautiful ornaments. Thought of staggering them myself, mixing it up with both ornaments and candy canes! This is such an easy great idea I found here on pinterest. You can get these vases practically anywhere, although I am partial to TJ Max. They have tons and I usually pick them up for $5-$10. 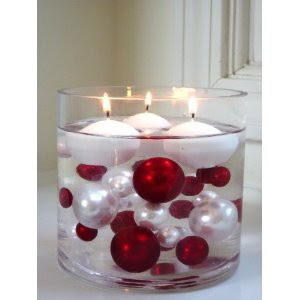 Grab some ornaments and some floating candles, a lil H2O and voila! 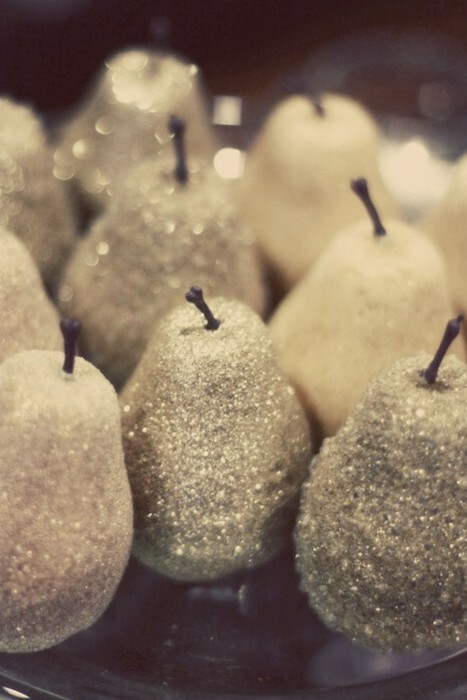 Ever seen those ugly faux plastic pears? Ever dream they could look like this!? All it takes is a lil silver, or any color you like, glittery spray paint and you have some seriously bling Christmas decor!